This company owns and operates boat loading facilities in Houston, TX for oil, natural gas and propane. Historically, propane had been loaded onto tankers during the winter to minimize heat expansion and facilitate faster transfer from land to ships. World demand has grown and changed; now ships must be loaded in the summer months too. But because the dry cooling tower could not keep the propane cool enough during the hot summer days, the transfer rates would stop or be so slow that tankers would start lining up in the harbor. 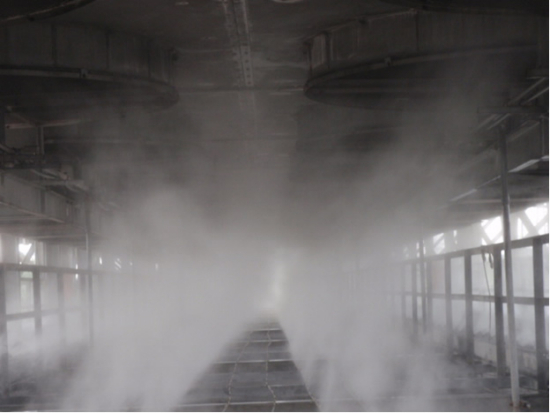 Hydrobreeze Misting Systems designed its largest state of the art 1400-Nozzle Commercial Pre-Cooling Misting System which was installed under the dry cooling tower in order to lower temperatures. The cooling capacity was improved by approximately 30%. So that even on the hottest days, the propane transfer rates were as good as the middle of winter. System was so efficient that entire project was paid-off within 1 Day! Talking about return on investment! 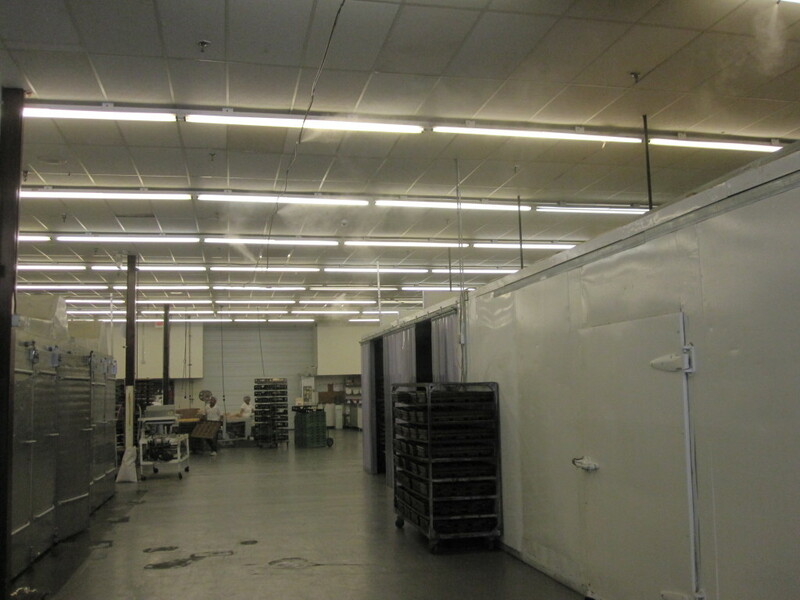 This commercial bakery mass produces a wide assortment of fresh breads, rolls, buns, muffins, cookies, cakes, pastries, pies and other specialty items on daily basis. Bakery is one of the largest supplier for restaurants and grocery stores in greater Houston area and operates 7 days a week. Entire indoor facility has no air conditioning system and their 150ft long oven room consists rows of walk-in ovens operating 12-15 hours a day. Average indoor temperatures of 100-105 degrees was normal. Heat from these ovens made it almost impossible for the employees to work in and around this oven room and be productive at the same time. In addition, extra dry heat was ruining baked products. This company owns and operates several rental location around Houston area. Their fleet consists of more than thirty-five different vehicle types encompassing a wide range of trucks, vans and passenger vehicles. 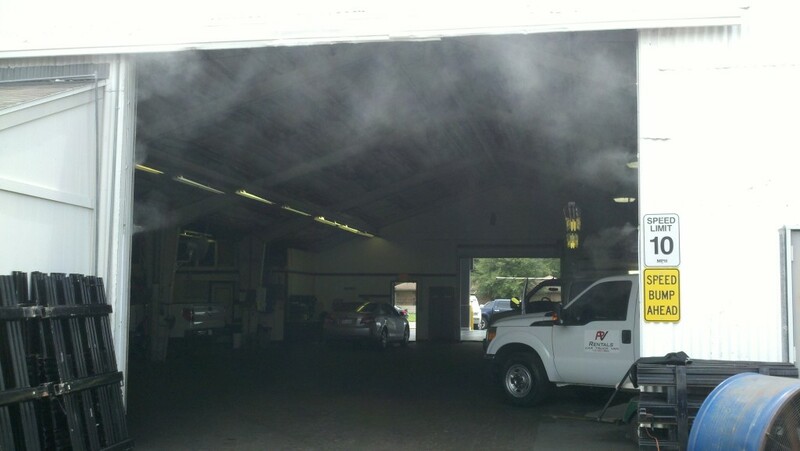 Company also operates a 10,000sqft service center where it performs maintenance on its vehicles. 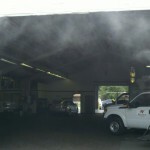 Just like many other auto repair facilities, this building did not have central air conditioning. Working conditions became miserable during hot summer months. Existing floor fans were no help as they simply moved hot air around. 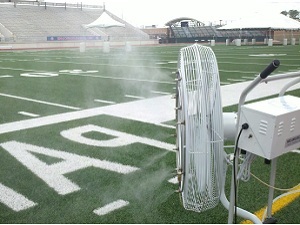 Engineers at Hydrobreeze Misting Systems designed a mist system that utilized positive ventilation technique to cool the hot air and displace it every 3-5 minutes. This allowed fresh air in to the building and eliminated “hot spots.” Once installed, combination of high velocity oscillating mist fans and stainless steel misting line drastically reduced the overall temperature and created a pleasant working environment for the employees. Jewell manufacturing facility produces Architectural Masonry and Concrete aggregate products that are used in thousands of construction projects throughout United States and Canada. 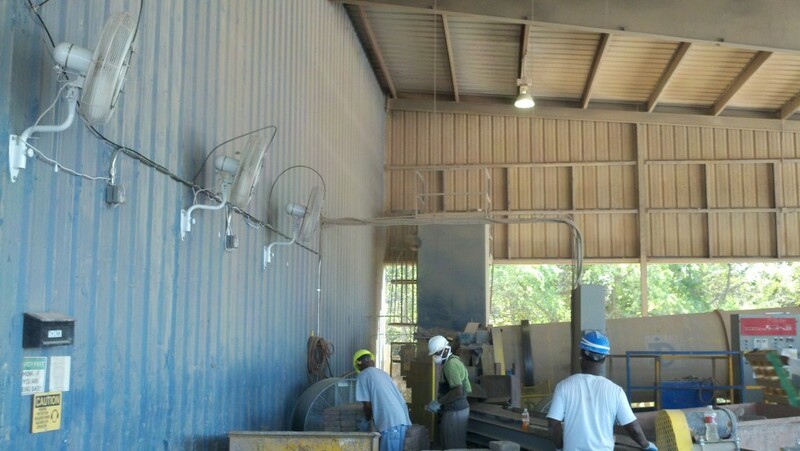 Company’s Richmond, TX plant produces pavers, concrete block, stone and bricks. Plant’s outdoor tumbler area and indoor conveyer belt areas became extremely hot during summer months. 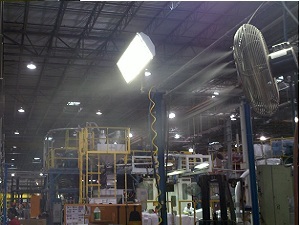 In addition, manufacturing process produced heavy dust particles throughout the facility. Hydrobreeze Misting Systems strategically installed UL Outdoor rated, high velocity oscillating mist cooling fans for both indoor and outdoor working areas. This high performance system not only helped reduce the temperatures, it also suppressed dust particles. Result was cool, comfortable and productive working environment with better visibility and breathing conditions. Overall cost of system was significantly less than what company had previously spent on ineffective and space hogging evaporative coolers. 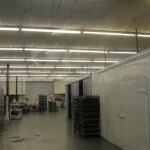 This Cooling/Dust suppression system was installed overhead with zero footprint. Igloo is one of the largest recognized brand in USA with its ever expanding line of coolers. At its world headquarters in Katy, TX, company’s blow molding plant operates 24/7 to meet high demand for coolers. Heat generated from the blow mounding machines was resulting in 10 to 20 degrees higher temperature difference on any given day and time. Cost of installing central air conditioning system for building that is over 100,000sq feet was outrageous and impractical at the same time. 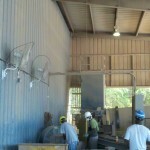 Facility already had 30” wall mount fans installed in various areas of the plant. Hydrobreeze Misting Systems came up with a plan to utilize those existing fans and retro fitting them with a high pressure misting system at a fraction of the cost. Instantly cooler and more comfortable working space was created to reduce heat stress and heat related injuries among workers. Igloo is currently in talks to install similar misting system for its adjacent shipping and receiving facility. Above institutions combined educates thousands of young children in greater Houston area. Each facility houses multiple playground areas for various age groups. During the hot summer months, their outdoor playground areas became unplayable for the kids. Teachers and parents simply could not expose kids to extreme outdoor temperatures. As a result, kids were forced to spend their precious recess time indoors. Hydrobreeze Misting Systems designed and installed custom fabricated mist lines for each of their playgrounds. Each systems was specifically designed with kids’ safety in mind. Automatic Timers and controllers ensured that systems would automatically turn ON/OFF during pre-set recess times. Kids are now able to enjoy the playground even on the hottest summer afternoons. This scenic property is the perfect setting for outdoor weddings, celebrations, functions or meetings. Venue can be rented for any outdoor event. Even though large trees provide shade throughout the property, guests were uncomfortable spending the time in the heat and opted for cooler/indoor space. As summer days got hotter, owner saw their event reservations dry up. Hydrobreeze installed high pressure mist fans throughout the property without compromising the looks of the venue. With combination of permanently mounted oscillating misting fans and portable mist fans, owner is now able to cool almost any part of the facility with a push of a button. Multiple zones and valves allow guests to control the amount of mist for their immediate seating areas. Facility now hosts afternoon events even during triple digit summer days. 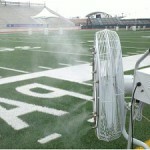 Misting system has become one of its largest selling points. Bravo Ranch Supermarket’s newest Houston branch provides healthy choices in meat, produce and groceries at family friendly prices. 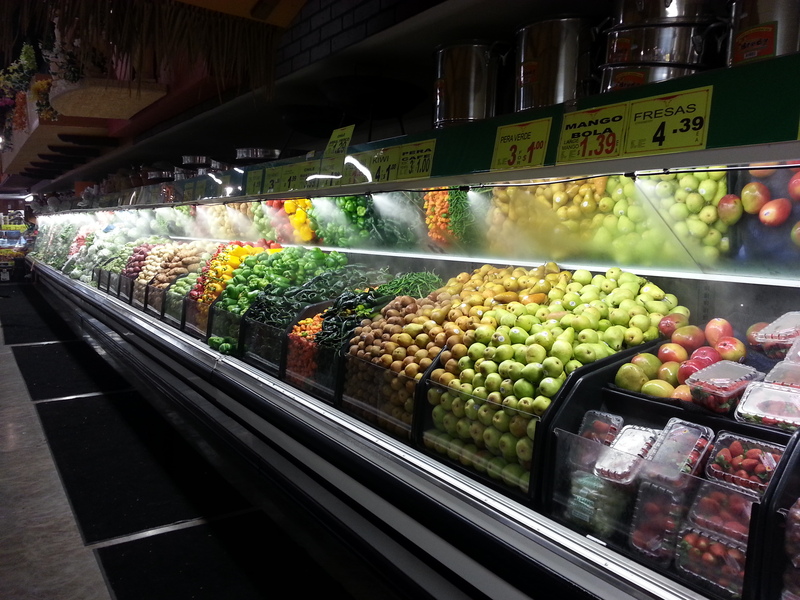 Store’s produce section carry wide variety of fresh fruits and vegetables. In order to keep them fresh, store employees had to manually spray water on the products at timely intervals. This redundant and time consuming job was a hassle for the produce manager and prevented him from allocating employees for more important jobs. Produce was going bad sooner than expected as employees would sometimes forget to spray at regular intervals. Hydrobreeze custom manufactured a mist module with automatic timer that would spray just a right amount of mist every 5 minute intervals. Hydrobreeze technicians made sure that mist produced would evenly cover the all the produce and prevent customers and floor from getting wet. NSF approved filtration system was used to filter the water. 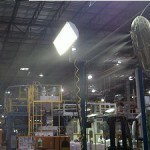 In addition, entire mist system utilized non rusting parts to prevent any health hazards. 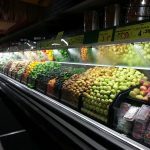 This misting system was completely automatic and allowed produce manger to increase overall department productivity while offering the most delicious and juicy fruits and vegetables to everyday customers.